Soprano Danielle de Niese debuted her first Huffington Post blog last year. She will be chronicling her time in New York City exclusively for Huffington Post as she prepares for the release of her next album, Beauty of the Baroque, and prepares for the World Premiere of “The Enchanted Island” at the Metropolitan Opera. The Baroque era saw the birth of opera as a viable musical form. This period of 150 years (from around 1600 to 1750) propelled opera into music’s most enduring and historic form. Opening nights at the opera during the Baroque period were the center of popular culture and drew huge audiences throughout Europe, eager to witness these new works and the star singers who brought them to life. The most famous operas of this period were written by composers like Handel, Lully, Rameau, Charpentier, Vivaldi and Gluck, though there are thousands of operas which have not survived, or have yet to be rediscovered. Virtuoso singers like Farinelli, Senesino, Cuzzoni and Bordini were the pop stars of their era. The most successful writers of the time such as Abbate Pietro Metastasio and Nicola Francesco Haym were queuing to create libretti (the text of an opera) to be set to music. Composers were at the apex of creativity, constantly challenging traditional forms and ushering in new musical forms. The “da capo” aria made its debut in the Baroque period. This form consisted of a primary melody (called the A section), a different contrasting melody (called the B section) and a return to the A section with ornamentation — as close to a pop song as you can imagine in its chorus-verse-chorus format, with catchy melodies expanding and repeating, allowing the singer to improvise and embellish the melody of the repeated A-section with added riffs and extrapolated notes in a superhuman display of virtuosic talent. Scandals were rife amongst the “A-list” stars of the era, with plenty of competition between divas and divos all vying to be the star of a great composer’s next creation. Audiences were frenzied, with women even fainting at the rapturous sound of the castrati singers (yes, it means what you think it means!). The Baroque era was much like Hollywood’s Golden Age: a time of ground-breaking musical development and achievement. Wait a minute, Baroque music is 400 years-old! What’s new about it? In this case, the answer is: absolutely everything. This new adventure is the brainchild of the Met’s modern impresario Peter Gelb. It represents a huge departure from the normal productions one would see at the Met because the main idea is to present musical gems from the golden age in a form called the pastiche, which is, by definition, a potpourri of various composers. In the 18th century, Baroque composers like Handel and Vivaldi would often reorganize their own creations to tailor-make a new and inventive theatrical spectacle that would showcase the talents of the particular artists for whom they were writing. A composer would essentially create a new piece out of their existing material, refashioning it, sometimes with a completely different libretto. This new production will mark the first time a major opera house will undertake the task of creating a modern-day version of this historic art form. The Met, together with the creative team of librettist Jeremy Sams, director Phelim McDermott, and conductor William Christie, have given us something unique: a chance to virtually travel back in time, using modern technology to enhance the experience. Instead of Farinelli (though my last costume comes pretty close to channeling the great castrato), the Met will showcase the current interpreters of our modern age. Today’s ba-“rock” (I couldn’t resist) singers will meet on the Met stage to celebrate Baroque opera’s current popular renaissance. In one extraordinary work, you can experience it all: a story drawn from Shakespeare (The Tempest meets A Midsummer Night’s Dream), set to the glorious music of the Baroque masters sung by some of the world’s best singers, in a fantastically inventive production which will combine Baroque scenery and modern digital video techniques. The word baroque can be used to describe anything “irregular, bizarre or otherwise departing from established rules and proportions.” This is what defines The Enchanted Island‘s premiere at the Met, so don’t miss the opportunity to witness this ground-breaking moment in operatic history. 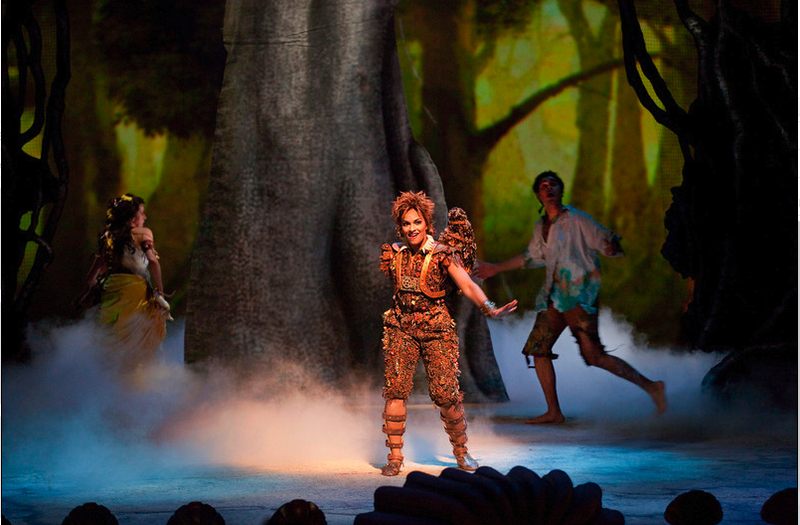 “The Enchanted Island” opens tonight, Dec. 31, at the Metropolitan Opera. It is written and devised by Jeremy Sams and directed by Phelim McDermott. William Christie conducts a cast that includes Danielle de Niese as Ariel, Lisette Oropesa as Miranda, Joyce DiDonato as Sycorax, Anthony Roth Costanzo as Ferdinand, David Daniels as Prospero, Plácido Domingo as Neptune, and Luca Pisaroni as Caliban. The Saturday, Jan. 21 matinee will be transmitted worldwide as part of The Met: Live in HD series, which now reaches more than 1700 movie theaters in 54 countries around the world.